Lagos, Nigeria, 24th August, 2017 — HP Inc. today unveiled the new HP DeskJet GT 5820/10 All-in-One series targeted at high-volume home users looking for a wireless ink tank printer that never stops. 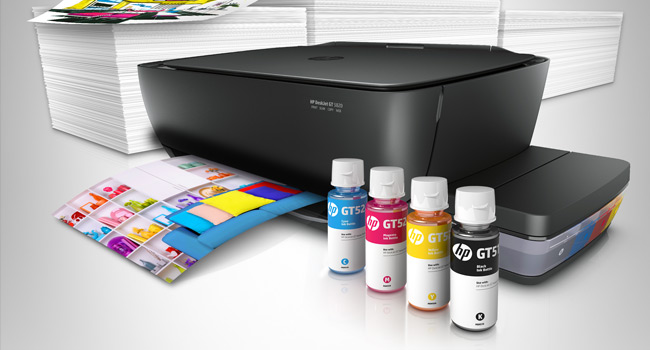 Replenishing ink is also clean and easy with HP’s innovative spill-free refill system. The bottles can simply be plugged into the tank without any squeezing required. Users can also easily monitor ink levels with the transparent ink tanks. The working environment today needs to be connected and wireless. The new HP DeskJet GT 5820 All-in-One printer makes it easy for users working remotely to connect via smartphones and tablets. The printer can be set up out of the box using just a mobile device. Even without a wireless network, Wi-Fi direct enables users to directly connect their printer to the mobile device at home. In addition, with the HP All-in-One Printer Remote app, users can quickly send scans to email or cloud storage through their mobile device. They can easily print from a variety of devices including iPhone® and iPad® using AirPrint™, or smartphones and tablets running Android™, Windows® 8, Windows® 10, and Google™ Chrome™ operating systems. The new HP DeskJet GT 5810 All-in-One presents the same functionalities as the HP Deskjet GT 5820 All-in-One but without Wireless capabilities.